It’s not even a year since the Bladerunner 2 was released, and now we have the Bladerunner 3? 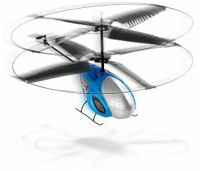 With 3 channel Digital Proportion Control it’s a breeze to fly in any direction you care to mention, and it comes pre-assembled and complete with its transmitter, charger and instructions. This magical beast will hover so steadily you’ll think it’s been nailed to the thin air, so at last precision take off and landing from strategic bases around your living room is possible, without dicing a nearby plant or the cat. A full charge will give you about seven minutes flying time and it’s tough. Normally three channel choppers, whilst giving you maximum maneuverability, are not for the fainthearted, but the Bladerunner 3 is so solid that even a spatially challenged halibut can control it. Get the Bladerunner 3 for £59.95 today. Looks like the entry price has not changed.